Ed Sheeran’s Perfect remains the front-runner for this year’s Christmas number one, but Eminem is closing in fast. 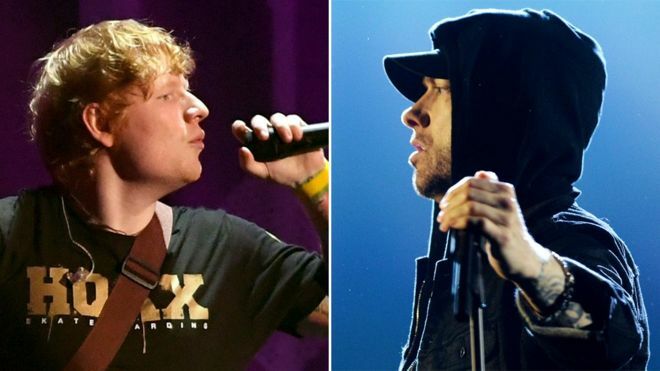 Eminem is a surprise new entry at number two in the mid-week chart update with River, a song that dissects a toxic relationship. According to the Official Charts, Sheeran is still ahead on pure sales, but Eminem is getting more streams. “You couldn’t call it one way or the other without being wrong,” charts expert James Masterton said. However, River also features guest vocals from a certain Ed Sheeran, the star could essentially replace himself at the top of the chart.